First Half Marathon Long Training Run – Check! 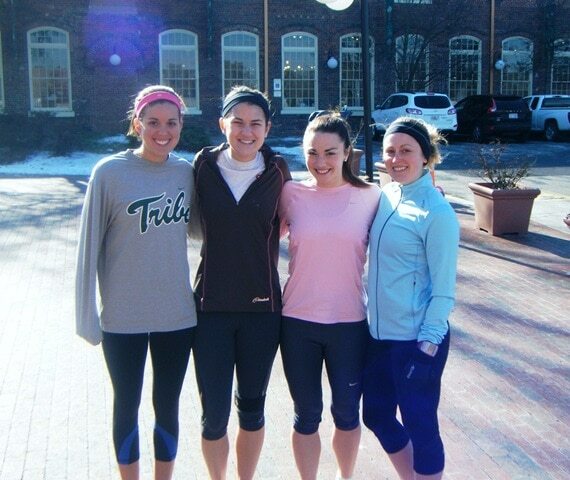 I met the girls at 11 a.m. for our first half marathon long training run! (Check out my training plan in this post). Exciting. Woohoo! We ended up running 6.10 miles in 54:06, for an average pace of 8:53. Not too shabby! We sprinted the last 0.10 miles per my insistence — I love finishing out runs with a short sprint. Makes it feel like a race and it’s more invigorating to stop after sprinting all out than it is to just peter out! After our run, we decided brunch was in order. We walked over to a place in Carrboro called Jessee’s Coffee & Bar. It was super cute inside! I ordered the Breakfast Burrito, stuffed with egg, potato, white cheddar, salsa, avocado, and mixed veggies. So delish! I’m off to the mall to use my gift cards. Have a great Saturday! p.s. Anyone else watching Miss America tonight? I am because I have to cheer on my girl Miss Vermont! Remember when I met her?! Previous article: A New Workout Move Video – Weighted Squats! Sounds like you had a great run with the girls! That brunch idea is great too! It’s so sad that 45 degrees sounds like a heat wave this time of year. Great run! I was able to knock out 5 miles today; it’s always more encouraging to run father with friends. I had my first long run for marathon training today! Glad you see yours went well too. I blogged about my long run too –> http://eatontherunblog.com/home/2011/01/15/lsd-long-slow-distance/ Happy Weekend! Running with peeps is ALWAYS better. I also love finishing a run with a sprint, makes it more fun. Nice mile times too!! what a great run! if i had such a fun group to train with, i think i’d be SO much more motivated to do races. training by yourself is just not as much fun. your brunch looks perfect too. 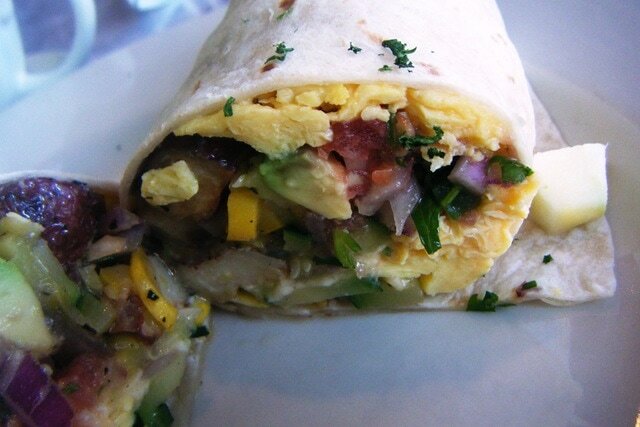 i’m a sucker for any kind of breakfast burrito. looks delicious! Running with friends is always great! I’ll be cheering for Miss Vermont too, a girl I went to school with was Miss Teen Vermont a few years ago. That’s awsome, good for you!! The biscuit sandwich looks good and so does the wrap. I make biscuit’s every weekend for my family. You know DC is considered the South too. I do remember Miss Vermont. You meet her in Stoneybrook if I remember correctly. I didn’t know Miss America was still on TV. I will have to scroll the TV. I will bet the shopping part was fun. I love to shop. You finished your run under an hour, that sounds pretty darn good to me. Let us know what you bought on your shopping spree. All of your food looked yummy! Congrats on your run this morning! Great run!! I’m starting training this week and hopefully my runs will be better than my first attempt yesterday. I need to get back into the running groove! Sounds like a great run. It was looked like a beautiful day out. I love good breakfast food! Which Garmin watch do you use? Just curious because I am looking to buy one very soon. I am also Half-Marathon training right now here in Arizona. It’s in the little Amazon “products I love” widget in my right blog sidebar! Next brunch go to Elmo’s (the sign behind you!) or Foster’s Market. I graduated last spring from UNC grad school and I miss both those places so much. Once it gets nice out, Weaver Street Coop is great for an outdoor brunch. Enjoy your time down there–miss it tons! 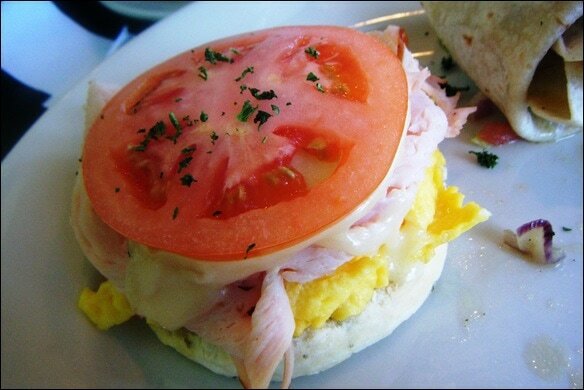 Um, that open face biscuit thing looks awwwwesome…! Congrats girl! I’m so jealous of your warm weather, it’s a balmy 19 degrees ova here! congrats on finishing the first long run! So exciting.